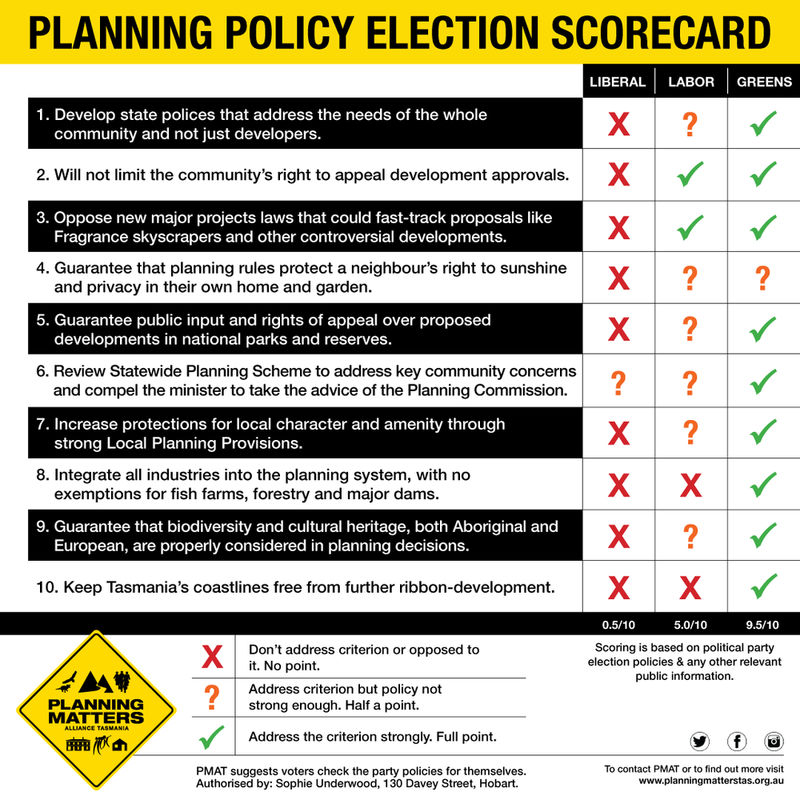 Today the Planning Matters Alliance Tasmania released its Planning Policy Election Scorecard. The launch comes as PMAT commences its second election television advertisement. The advertisement links private commercial development in reserves and high rise hotel proposals with the simple fact that the public could have absolutely no role in the assessment of these proposals, or rights of appeal. PMAT has scored the three main political party’s planning policies against ten criteria that reflect the alliance’s priorities for making the planning system stronger. Overall the Greens are strongest on planning policies, scoring 9.5 out of 10, Labor gets a pass with 5 out of 10, and the Liberals get an abject failure score of just 0.5 out of 10. The scoring process revealed the Tasmanian Liberals are committed to changing legislation to limit who can appeal development approvals and have made many more developments permitted - removing the community’s right to comment on and appeal developments. It also supports major projects legislation that would give the minister unprecedented powers to call-in developments, taking the assessment away from councils and removing the community’s appeal rights. “The most telling outcome of the scorecard is that the Liberal party stands alone in wanting to strip away basic rights for the community to have a say over development proposals and to appeal development approvals, so it can force through developments the community does not support,” PMAT Coordinator Sophie Underwood said today. Tasmanian Conservation Trust Director Peter McGlone helped score the party policies. “The Liberals are determined to remove any effective influence the community has in our land use planning system, while pursuing a business first approach,” he said. Sophie Underwood warned Tasmanians would lose their rights to appeal. “While Tasmanians are facing dozens of private commercial hut, lodge and helicopter-based developments in their favourite parks and reserves, it’s important to realise that under the Hodgman Government’s planning scheme, they’ll lose the guarantee of community consultation and the rights to appeal. “The Liberals also want to introduce a system where a neighbour's right to sunshine and privacy in their own home and garden are not protected and can be taken away without any right to have a say. “In contrast the scorecard process found that the Greens and Labor are strong defenders of existing appeal rights and both oppose the Liberal’s major projects call-in powers. The Greens are superior to Labor in terms of protecting our coastline from ribbon development. Critically, Labor has baulked at supporting the need for all major industries to be integrated into the planning system - it continues to support a system that provides special deals for fish farms, forestry and major dams. While Labor has supported the need for planning policies only the Greens have supported state policies and have put forward specific priorities. At the last election the Liberals promised to develop planning polices that should have given the community a say over the objectives of the proposed new statewide planning scheme, but planning policies have not been delivered. Labor has flagged the need to have biodiversity and cultural heritage properly considered in planning decisions but again the Greens are much stronger, making specific commitments to changing the planning scheme to provide protection. Older PostPlanning Matters Map of Tassie - by Josh Pringle - launches!